What I really like about T25 workouts is that they only take 25 minutes and at the end, you get a really good workout (you burn lots of calories!). They are great for those who are short on time or who don’t want to spend too much time exercising (as they’d rather do other things). You can find all kind of workouts from Shaun T but the exact programme I’ve been following is called T25 Focus Alpha (available from Amazon as part of the package). 01. Focus T25 Cardio Alpha-1 from goldgnom on Vimeo. Now, I still do Shaun’s workouts but not as often. I aim for 1-2 a week but I will see how that goes and maybe if I feel like it, I will do them more often. But now, my focus is on something else – on weight training (or also called, strength training)! Yes, this month I started lifting weights as there are so many benefits behind this so I thought to give it a go and see what it does for me. I am not totally on my own with this though, I am using an online personal trainer who devised a training programme for me which I am now following. 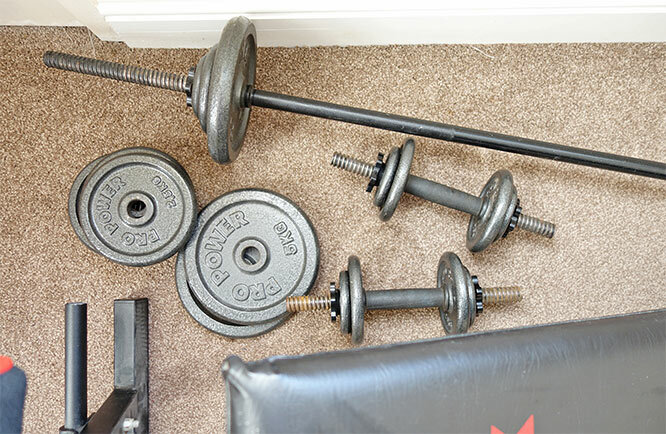 I do the weights workouts at home since I already have all the dumbbells and a bar (from my partner! ), so, very convenient. I will be reviewing an online personal training service that I use on my blog very soon so stay tuned if you want to know more what it’s like. But so far, so good. My personal trainer is very helpful, really knowledgeable and I cannot wait to learn more tips from him. I am planning to send him some videos of my workouts so that he can make sure I am doing the exercises correctly. So it’s really good I can do this and since everything is done online (via chats, emails and videos), the cost of this service is much less compared to the personal trainer you would see in person. So, my main ways of keeping active this winter are home workouts, walking and then occasional skiing (need to plan that out though!). I am still open to any other activities that I may have an opportunity to participate in. For example, I saw that I can play table tennis for free in my local shopping centre so I cannot wait to give that a go. And then, if anything else interesting comes my way, I would probably give it a try. Going forward, I really want to get myself back on my bike and I will try to do this soon, weather permitting. But I really cannot wait for the winter to finish as I can then enjoy the outdoors properly without the rain and cold. I am also thinking of my next active holidays as I think in winter it would be a good time to plan this.